Kahala is known as the “Beverly Hills of Honolulu,” thanks to the multimillion-dollar homes that dot this neighborhood. Home to some of Hawaii’s elite, Kahala exudes a secluded, exclusive feel while being only minutes away from all the happening places and events in Honolulu. Kahala is located east of Diamond Head, the historic peak serving as a majestic backdrop to the neighborhood’s coastal area. Kahala Avenue, the community’s most defining thoroughfare, stretches alongside the beach from Diamond Head Road to the prestigious Waialae Country Club. The neighborhood offers several access roads to Kahala’s beaches, where there are less crowds and a more laidback atmosphere. Those who seek the beach party vibe need only to drive a short distance to Waikiki. The streets of Kahala are lined with coconut trees and lush greenery that make up the neighborhood’s landscaping. Large lot areas add to Kahala’s low density and tranquil atmosphere. The neighborhood also boasts a few parks that offer plenty of outdoor opportunities. Kahala has one of the flattest topographies in Oahu, making the area ideal for a wide variety of outdoor activities like hiking, biking, and running. With its central location in Honolulu, residents get easy access to urban centers and amenities, including sprawling shopping malls, restaurants, and entertainment and nightlife options – some of which can be found right within Kahala. 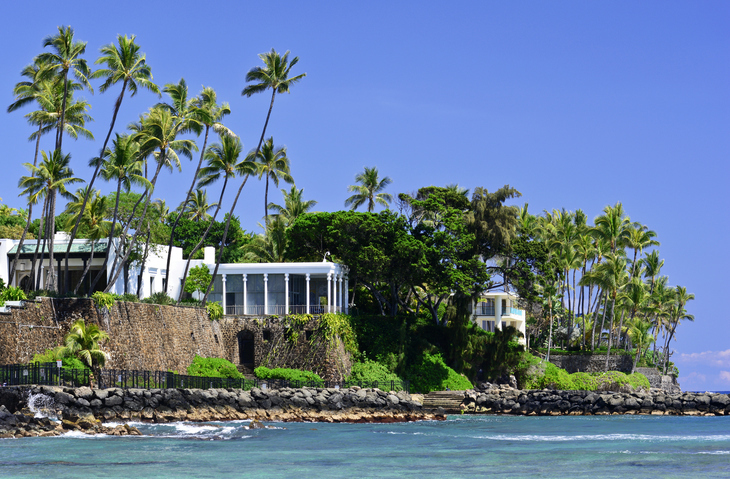 Since its origins in the early 1920s, Kahala has always been synonymous with wealth and prestige. This is reflected in the neighborhood’s homes, which are mostly expansive single-family properties with beautiful architecture and large landscaped yards. Thanks to the neighborhood’s long history, Kahala’s real estate today is a vibrant mix of older and newer homes. You will find Ranch-style homes built half a century or more ago, many of which have been updated and refurbished over the years. Quite a few are ideal fixer-uppers that will appeal to savvy investors and those who prefer to preserve and live in homes that have become part of the island’s history. Kahala’s most desirable homes are stunning oceanfront properties with significant custom architecture and state-of-the-art features and amenities. Found in exclusive gated communities, they boast indoor/outdoor plans that make for the most luxurious resort lifestyle. While single-family homes and estate properties make up the majority of the housing stock in Kahala, a few condominiums and townhomes have recently made it into the market, offering excellent locations close to shopping and other urban amenities. This indoor mall is Hawaii’s second largest shopping center. It is home to numerous shops and stores ranging from luxury brands to local favorites, restaurants offering various cuisines, and a multiplex theater. This legendary luxury getaway has welcomed some of the most famous celebrities in the world since its construction in 1964. It features an 800-foot stretch of white sand beaches, a private lagoon where guests can interact with dolphins, a spa, banquet facilities, upscale restaurants, and more top-of-the-line amenities. The home of the PGA’s annual Sony Open tournament, this exclusive golf, and country club features a prestigious Seth Raynor-designed championship course, a beautiful clubhouse, beach facilities, and aquatic, fitness, and tennis centers. Are you considering buying or selling a home in Kahala? I will be happy to be your real estate guide. Give me a call at 808-214-0302 or send an email to Greg@IsleLuxury.com.